Nine NBA games are here for us on a night with a big high-scoring NFL game, a perfect spot to try to catch other players in tournaments while they’re slipping and trying to figure out ways to cram both Saquon Barkley and Julio Jones into the MVP spot in Showdown slates. There are some really interesting ownership spots shaping up according to our projections that could help us get ahead of the field in tonight’s fantasy NBA slates and I’ll do my best to walk you through each and every one of them in this here column. Also to help you be smart about making lineups you should consider singing up for a premium account here at Awesemo.com. Between the top player in DFS’s rankings and ownership projections, plus projections from our Josh Engleman, Fast Eddie Fear and the former FanVice guys, you’ll find a lot of ways to move above the field with the information provided. Promo code SWITCHANDHEDGE will get you a half-month free on any membership so go sign up now. Nikola Vucevic beasted the 76ers in the Magic’s last game, getting 38 minutes en route to a monster performance against his former squad. If Vucevic gets that much run, he can find ways to be useful but I’m not inclined to point chase him today at much volume with his price up a little in a matchup with a Celtics team who will be far less hospitable than the defensively lackadaisical Joel Embiid. Evan Fournier will also have a tough matchup but his 29.8% usage rate thus far this season intrigues me in a matchup where scoring will be at a premium for a Magic team with one of the lowest totals on the slate. Aaron Gordon has also looked good this year and been a demon on the boards; I worry about his offensive prospects with the defensive matchups on the Celtics’ side but he does match up the best physically against the Boston defenders. Jonathan Simmons’ expected return hurts the appeal of Terrence Ross and really overall I’m not into a ton here given the Celtics’ defensive efficiency and the Magic’s mostly aggressive pricing. The Magic aren’t playing at a noteworthy enough pace to offer a significant boost to the Boston players, though they have been egregious on the boards thus far this year and that could be another nice spot for Jayson Tatum. Tatum has been aggressive on the glass so far this year with a 10.7% total rebound rate, best on the team, and he’s also been scoring at a clip as effective as anyone with a usage rate above 25%. I like him in pacier matchups but Tatum at under 5% ownership is appealing to me. Kyrie Irving has been mostly mediocre to start the year and I don’t necessarily see this being the game where he gets it all going. The Magic have allowed teams to assist each other at a decent clip so it’s possible Kyrie’s playmaking ability is on display tonight but overall I don’t find a ton to love on this side either amidst the Marcus Smart, Marcus Morris, Jaylen Brown tier of folks. Maybe Gordon Hayward could get you to 5x or more value but I’m not sure he has enough of a ceiling with his current run of minutes. The Hornets and Raptors play at a comparable pace and this grades out as another strong Kemba Walker spot to me. His usage rate has been an outrageous 36.6% usage rate while chucking up 12.7 threes per game. Kemba’s the fulcrum of this whole offense and I do think the game stays close given how feisty the Hornets have looked thus far under new coach James Borrego. The minutes have really only consistently been there for Walker and Nicolas Batum while the latter currently projects to have more ownership because of a very cheap price. One would assume he’ll see Kawhi Leonard’s defense but that price is tough to avoid and Batum can put up fantasy points in a variety of ways. On the Raptors’ side, Kawhi Leonard projects to be one of the higher owned guys on the slate and this could be a big game for him. The Hornets have been better than expected thus far defensively but the Raptors’ offense has been one of the more efficient ones on the slate while Kawhi’s 34.2% usage rate is as high as any stretch he had in San Antonio. Kyle Lowry looks solid at his price even if I’d much rather pay $300 more for Kemba on the other side. You could definitely play both point guards in this game and have a decent shot at getting 50 points from each. Jonas Valanciunas had a strong per-minute game versus Washington but ultimately didn’t get enough time on the court to smash value like he was capable of. He’s still viable in GPPs, particularly given the Hornets’ deficiencies in rebounding and the overall unimpressiveness of Cody Zeller. With Kawhi back after resting versus Washington, the bench guys lose some appeal. Danny Green gains some appeal though; he’s put up 30.25, 26.75, and 42 fantasy points in the games that Kawhi has been active thus far this season. The Knicks and Milwaukee have played at similar paces thus far so neither gains a significant matchup boost. Enes Kanter seems like a tough matchup for Brook Lopez with his doggedness on the glass and while I’m not sure he’s got a gigantic ceiling in this matchup given how active on the glass the other Bucks are, he does seem like a very solid play who should safely land on value if the Knicks don’t get blown out. Tim Hardaway’s price is up but it seems justified given his 32.2% usage rate that has seen him put up over 20 shots in his last two games. If you think the Knicks keep it close, both Hardaway and Kanter could be useful in a game stack situation. Trey Burke is appropriately priced and I’m not too crazy about him as a result; his usage rate his dropped off a cliff in new coach David Fizdale’s offense and I would only consider playing him in a build based off Hardaway getting shut down. Noah Vonleh has a little interest for me after he got extended run following Kevin Knox’s injury against Boston, though those minutes could easily end up going Allonzo Trier’s way if Fizdale feels that’s a benefit in the matchup. Giannis Antetokuonmpo has looked really solid so far this season in every area but his three point game, a spot where he has yet to hit a shot from deep despite five attempts per game. There’s no one who should be able to do anything to limit him in this matchup and those efforts from deep could pay more dividends tonight. Khris Middleton looks good at his price but his ceiling tends to not be there whenever Giannis is active. Ersan Ilyasova is getting enough minutes to be useful but his usage rate is the lowest of his career right now while Brook Lopez looks good but isn’t playing enough to be useful. Giannis right now is posting a sky high 39.5% usage rate under new coach Mike Budenholzer, which is 10% higher than he was at for most of least year, so he’s the guy I’m really waiting for a breakout game from here and that kills some of my interest in guys like Eric Bledsoe or Malcolm Brogdon. The Pacers have been one of the more offensively efficient teams on the slate and they’re going against a Timberwolves team who’s been one of the worst on the other end. They’ll also see a slight pace-up in the matchup, making this a really appealing one for Victor Oladipo. Oladipo should be under 10% owned and even though his floor is troublesome, the loose play the Timberwolves present on the other side should play into Oladipo’s hands. Domantas Sabonis is expected to return to the lineup in the matchup and that hurts the super sneaky value that Kyle O’Quinn presented in the Pacers’ last game. O’Quinn looked good in his limited run and it’s not impossible he carves a few minutes off of Sabonis, which would hurt his shot at continuing to exceed value in run off the bench behind Myles Turner. Sabonis should match up really well with the Timberwolves though and could feast on the offensive boards. Despite Turner’s solid game versus Brooklyn with Sabonis out, I’m still not buying into Turner as a trustworthy play. It may be a narrow margin with his minutes, but I’m also a faint bit intrigued by Tyreke Evans in this matchup. He’s looked good in the minutes he’s seen the floor and the pace-up versus Minnesota should play nicely into his hands. Karl-Anthony Towns’ price continues to fall as he’s looked like he’s suffering from Jimmy Butler-induced PTSD thus far this NBA season. Towns asserted himself more with Butler sidelined versus Dallas but it wouldn’t be surprising to see him recede into the background again with Jimmy back in the lineup. Butler is always in play and seemed motivated by the home crowd’s mixed feelings before him in the last matchup. He may have a tougher time than usual if he draws Victor Oladipo defense but a Butler/Oladipo stack makes some sense to me. Andrew Wiggins played worse with Butler off the floor versus Dallas but he remains still only a mildly interesting play with tough to pinpoint upside. Derrick Rose is starting to look like vintage Derrick Rose but that likely won’t be a factor with Butler back in the starting lineup. This game will find some ownership but it could end up being one of the best game stack options around given what should be a pace-y matchup with two teams who’ve been really atrocious defensively thus far this year. Bobby Portis disappointed a lot of people as chalk the other night and he’s in a matchup now where no one can really inhibit what he does on the Mavericks’ side. There will be less rebounds to go around in the matchup but Portis should get back on track and have a ton of upside still at his price. Zach LaVine is getting closer to his price ceiling but his 33% usage rate should remain mostly steady even with Kris Dunn returning to the lineup. It’s worth noting that based off last season, Kris Dunn negatively impacted both LaVine and Portis when on the court with those guys going from 1.1 and 1.24 FPPM to with Dunn off to 0.96 and 0.93 FPPM respectively with Dunn on the court. Portis’s role has changed enough that it wouldn’t be a concern for me but LaVine’s does worry me a little. Jabari Parker is at a usable price and he should be able to get his offense going if he gets enough run given how the Mavericks have been the worst team in the league in terms of defensive efficiency thus far. Justin Holiday remains a bit underpriced given the minutes he sees and the matchup and he’s the one rotation player who’s been positively affected by Dunn in the lineup. The Mavericks get a slight pace-up and a nice matchup across the board versus the Bulls. DeAndre Jordan’s price has soared after a big game but this matchup with the Bulls might be too good to avoid. 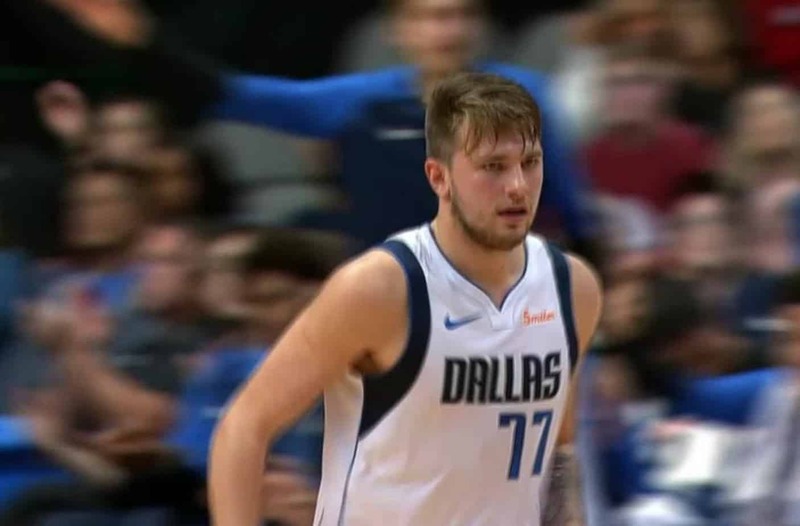 The Bulls drawing fouls at a decent clip is the one thing to fear but given the Bulls’ rebounding deficiency and their horrendousness at switching, Luka Doncic and Dennis Smith should be able to throw lobs to DeAndre all day. Doncic is coming off his first big game and I’ve got no problem with him in this matchup even though the ownership does make him a bit less appealing. Regardless of whether he smashes value tonight or not — and I’ll certainly bank a lot on him having a good day — he’s so good at driving the offense that even if he falters, the offense himself should be helped by his dedication to the pick and roll and cutting for easy baskets. From an ownership perspective, Dennis Smith and his identical usage rate could be the smarter play though. JJ Barea’s also been going off lately and while his minutes worry me a little bit, if he continues to be as effective as he’s been versus this squad, things could be great for him at a nice price. Dorian Finney-Smith continues to look decent but with a low ceiling at a workable price as does Wesley Matthews (who took 19 shots last game and would obliterate value if he shoots better at that volume today) while Dwight Powell is stupid expensive but might be worth it too in this matchup. You could really play a lot of dudes here and I’d be perfectly okay with it even if the ownership on the starters besides DeAndre scares me a little. Jaren Jackson has been killing dudes thus far this season and he honestly might be similarly playable with the Jazz playing at a decent pace and not being terribly efficient defensively thus far this season. Jackson is averaging 1.28 FPPM and should be on your radar until his price jumps; his opportunity would be benefitted by a blowout but he should get a shot at some of JaMychal Green’s minutes along with Omri Casspi with Green sidelined. Marc Gasol’s minutes have been down a bit with the Grizzlies getting blown off the court recently and this matchup versus Rudy Gobert doesn’t seem like a great one (though Gasol did go for 5x+ value in every matchup versus the Jazz last year). You could talk me into Conley or Gasol flyers but I’m not in love with the play given some blowout risk and the chance of the Jazz playing down pace after running because of matchup in their last few games. Garrett Temple would hold a little interest for me after he was one of my better plays given out on the Live Before Lock show on Friday; he won’t put up 40 points again but at $4,000 on DK he could be decent if the Jazz do play at a solid pace yet again. The Jazz should be able to dictate the matchup tonight and I’d really like to see Donovan Mitchell get on track here at under 5% ownership. The Grizzlies have allowed opposing teams to shoot 53% from the floor so far this season and been one of the worst teams in terms of defensive efficiency, a nice get well spot for Mitchell after disappointing 8-for-21 and 7-for-23 performances to start the year. Joe Ingles has been stellar and deserves a look despite his price going up; he won’t continue to be this efficient forever but he can still be a solid mid-priced guy with a higher than expected ceiling. Ricky Rubio hasn’t been dominating the ball as much as he did during his good stretches last year but he too could get going in this matchup given how bad the Grizzlies have looked and how they’ve allowed the best assist rate on the slate. Rudy Gobert seems like an okay play though there are definitely centers I like a lot more. Lastly, Jae Crowder’s been getting solid run and just being on the floor versus the Grizzlies may give him a shot at being useful from a fantasy perspective. Dwight Howard remains out for the Wizards so the rotations should stay the same as we’ve seen with no one really fully stepping up to fill in for him. Ian Mahinmi doesn’t really see enough run to soak up that opportunity without him, neither does Jason Smith. John Wall and Bradley Beal both seem like totally solid plays who are mostly at the appropriate price on DraftKings; I’ve got no issue playing them but there isn’t a lot of value to unearth there in this matchup. Beal had some good matchups versus Portland last season but they were with Wall and his primary ballhandling role sidelines so that isn’t much to bank on today. Markieff Morris is a mildly interesting play to me at his price in a matchup that seems like the kind of rugged one he does best in but overall I’d likely stick with Wall and not much else. The Trailblazers have been one of the most efficient teams offensively thus far this year and this current Washington group shouldn’t offer a great deal of resistance. Jusuf Nurkic could feast on the Wizards but the amount of minutes he’s been getting, including a lack of fourth quarter run, worries me a little. Damian Lillard looks like a fine play with some upside at his price; he’s also gotten to the line 8 times a game and the Wizards have so far put teams on the line as much as anyone on this slate. CJ McCollum hasn’t had a hot start to the year but he could easily get going today if Lillard falters at all. Mo Harkless has looked good in his limited minutes but probably doesn’t have much of a ceiling or a floor while Al-Farouq Aminu hasn’t looked terribly reliable thus far after some quality run to end the year last season. The Suns have quietly become one of the lower paced teams in the league under new coach Igor Kokoskov but they’re going to need to find ways to score to possibly stay alive versus these Warriors. Devin Booker went cold versus Denver and currently projects to be under 5% owned in a matchup versus the Warriors that should be a tough one but will see him be able to shoot at will in an effort to keep his team alive. Booker and DeAndre Ayton will have tough sledding tonight but we know the upside we’ve seen from them so it’s not impossible to imagine both guys getting going in an unexpected spot. Isaiah Canaan has been a steady value thus far this season and it’s hard to pass him up at $4,300 on DraftKings. Canaan could falter tonight but at 32 minutes per game thus far, I like him more than dislike him even if the ownership on him is getting a little high. Trevor Ariza could be a little interesting, ditto Josh Jackson, but I’m not sure I would trust the usage for either given what I imagine will be a heavy dose of Booker tonight. Both Steph Curry and Kevin Durant project to be under 5% owned due to their prices rising and that does increase the opportunity in owning them quite a bit. Awesemo currently projects the lion’s share of ownership to go to Draymond Green and Klay Thompson, the latter of which certainly makes sense pricewise. Curry and Durant interest me a lot more as leverage and I think the under the radar decrease in pace for the Suns could make this one that isn’t as much of a layup for Draymond Green as people making lineups today may think. The Spurs and their bottom of the league pace meet the fastest paced team on the slate and the middle ground should have some interesting fantasy value. DeMar DeRozan has been solid and posted the highest usage rate on the Spurs with 32%; DeRozan playing at a pace increase back home in LA is an interesting spot to be tonight and could be a nice hammer give nhow bad the Lakers have been defensively thus far. LaMarcus Aldridge looks fine to me too, a little less appealing than DeRozan due to price but he could end up cleaning up on the boards tonight versus a Lakers squad who really can’t rebound at all. Pau Gasol could get close to useful if he sees slightly more than the 20 minutes per game he’s gotten so far this year. Patty Mills continues to get solid run and shots out of the backcourt while Bryn Forbes has been a little better per-minute but at a less appealing price. I don’t mind Forbes tonight even though he does kinda stink. Marco Belinelli seems like he could get going one of these days too and this does seem like a spot that he would. At just under 1% owned, I’ll likely have one lineup with him. The Spurs have been pretty bad this year in terms of defensive efficiency, particularly by their standards, but they’ve limited the damage by playing at a brutally slow pace. This actually could benefit LeBron James, a player who’s kind of been passive thus far with a 27.5% usage rate amidst the Lakers’ high octane offense. Lonzo Ball moving into the starting lineup is also appealing with Rajon Rondo suspended, ditto Kyle Kuzma filling in for Brandon Ingram. Lonzo averaged 1.24 FPPM with Ingram off the court last year and he’s not going to have a minutes limit today. Josh Hart’s minutes are trickling upwards and deservedly so with him looking like the best Laker on the court for stretches of games thus far. Kentavious Caldwell-Pope has looked demotivated thus far this year but he killed the Spurs last season for some reason; he’s fighting off Hart for playing time and this could be the day he goes a little harder to defend his role. Ingram’s absence has been an asset to KCP last season with Caldwell-Pope averaging almost 1 FPPM with Ingram off the court. Done and done, follow me on Twitter @ChrisSpags and I’ll see you guys tomorrow with more NBA insights and analysis.